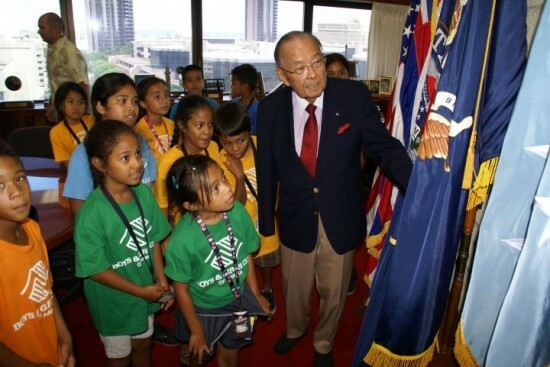 HONOLULU — Sen. Daniel Inouye (D-Hawaii) turned 88 — an auspicious age in Japanese tradition — on Friday. Born in Honolulu in 1924 and first elected to the Senate in 1962, he is the most senior member of the Senate as well as the second-oldest. Starting out as a member of the House of Representatives, he has represented Hawaii in Congress since it became a state in 1959. The World War II veteran and Medal of Honor recipient, who chairs the Senate Appropriations Committee and is third in line for the presidency after the vice president and speaker of the House, told The Maui News last month that if his health holds up, he will run for his 10th six-year term in 2016. Currently, Inouye is trying to maintain the Democratic majority in the Senate by supporting Rep. Mazie Hirono, who is running for the Senate seat being vacated by Democrat Daniel Akaka. Hirono’s Republican opponent in the November election is former Gov. Linda Lingle.